Riga is a modern city with 712.000 inhabitants and an area of 304 km². The target area is situated in the Jugla neighbourhood on the eastern outskirts of the city. Jugla is part of the Vidzeme district (since the year 2010 – centre district) and the second largest neighbourhood throughout Riga. It is divided from the planning perspective in five smaller units with very different characters. The main development as residential area began in the 1960s when multi-apartment blocks were built in the area. 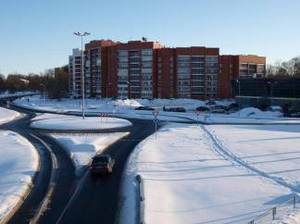 Today, there are major housing estates and one-family house areas, but predominately the neighbourhood is characterized by the Soviet-era highrise (mainly 5-storey) residential buildings constructed in the 1960s and 70s. In contrast to the overall development in Riga, where the number of inhabitants is decreasing, the number of inhabitants in Jugla is very stable with slight increase in last few years. Since the neighbourhood itself offers only a little number of employment possibilities, the majority of the residents are commuters or retired persons. Even though Jugla is predominately a residential area, elements of a centre can be found along the main arterial road and there are sub-centres situated across the entire area for the provision with convenience goods. The location at the eastern edge of the city and close to forests and lakes offers a high potential for recreation and leisure. The entire area is covered by a central heating system. Like in most parts of Riga the local heating company “Rīgas Siltums” is maintaining the central heating network and provides heat mainly to high-rise apartment housing estates and all kinds of public as well as service buildings. Individual homes – and to some extent – new residential apartment projects use often autonomous heating on a gas or solid fuel basis. The heating pipeline network is relatively old but it is partially replaced with prefabricated pipes and is still undergoing the renovation process which stabilizes the average technical condition of the heating grid in Jugla. 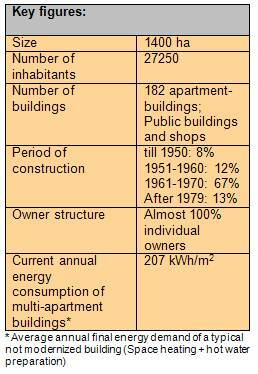 In particular the Soviet-era multi-apartment buildings, like many other places in Riga and Latvia, are facing large heat losses and a poor internal infrastructure. Installation of energy efficiency measures together with overall renovation and refurbishment of the buildings is the main challenge for future in this field. Energy price increase together with physical poor condition of the buildings will be the catalysts for renovation and refurbishment works. Major challenges in Jugla are to initiate a refurbishment process of the buildings in the context of a very hetero-geneous owner structure and to find solutions for the reduced working load of the two existing central heating plants that supply heat to the neighbourhood. Parallel the share of renewable energy sources (currently 2% in Riga) should be fostered. From the urban planning perspective major challenges are the inner acces-sibility on foot, by bicycle and public transport as well as the parking situ-ation and the insufficient street lightening. Due to the uniform con-struction style the neighbourhood lacks a visual identity. As a prerequisite to start an upgrading process it is very important to identify and communicate financial possibi-lities for complex approaches, to involve the public and to clarify legal issues about property questions. 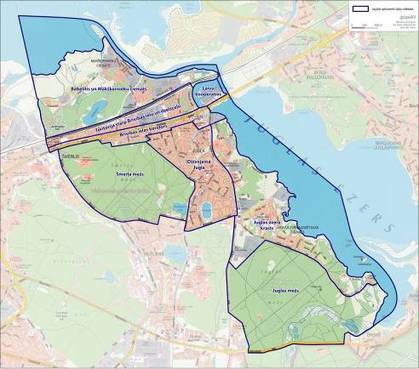 The city of Riga prepares an integrated concept for Jugla for the overall upgrading of the neighbourhood. It addresses local planning issues, architectonic solutions and possibilities to enhance the energy efficiency of the entire area. The public is involved during the entire preparation process. Since the majority of the apartments in Jugla are owned by individual owners the success of a development concept depends on the activation of them. It is important to enable individual owners by influencing unfavourable framework conditions and providing information. Therefore, the possibility to establish a special municipal building renovation company as well as a municipal revolving fund is assessed. To provide better information to the end-user, a special internet portal for online monitoring informs about in-door climate and consumption parameters of renovated and not renovated buildings.